OLATHE, Kan./June 4, 2012/Business Wire — Garmin International Inc., a unit of Garmin Ltd. (NASDAQ: GRMN), the global leader in satellite navigation, today announced the zumo 350LM GPS navigator – a stylish, rugged, sunlight readable, high-resolution and glove-friendly touchscreen device that helps keep motorcyclists on track, on and off the road. Mounted on the handle bars or in the car (motorcycle and car mounts included), the new zūmo 350LM’s design offers the flexibility riders want. With the zūmo 350LM, Garmin has designed more than just a GPS navigator. Its new Service History Log lets cruising enthusiasts record the date, mileage and type of maintenance performed on their motorcycles. Tire mileage, tire changes, tire pressure, chain cleanings, oil changes, new spark plugs – almost anything you can think of, zūmo will keep a record of it. Whether riding during a bright summer day or a moonless fall night, the zūmo 350LM has motorcycle-friendly features any rider will appreciate. Its large touchscreen color display is housed in a case that resists fuel sprays and UV rays. The zūmo 350LM puts all the information you need in an easy-to-read format as you travel down the road and features a glove-friendly intuitive interface that makes entering information as easy as shifting gears. The zūmo 350LM speaks street names and will deliver turn-by-turn, voice prompted directions, such as “turn right on Route 66,” via the built-in speaker headphone jack or through a compatible Bluetooth helmet or headset. BaseCamp™ compatible, the zūmo 350LM makes it easy for motorcyclists to plan their next ride. BaseCamp, a free software program from Garmin, allows users to create routes, waypoints and tracks from their computer and transfer them to the zūmo. With the “Track Draw” feature riders can trace their planned route and view elevation changes, helping estimate the difficulty of the ride. After an open road or off the beaten path adventure, send the ride to Basecamp to share the adventure with friends and relive the experience. 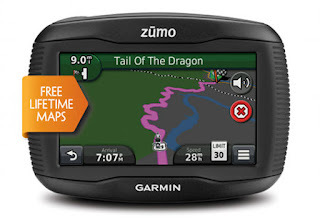 To see the zūmo 350LM in action, go to www.garmin.com/zumo. The zūmo 350LM offers you the convenience of lifetime map updates² (North American and European version available), which provides up-to-date mapping and the most current information about businesses like restaurants, ATMs, hospitals and more. With the easy to use premium navigation search bar, zūmo returns results for points of interest (POIs) as they are typed providing a faster, more intuitive experience. There’s also a speed limit indicator and Exit Services that display parks, gas stations, shops and restaurants for upcoming exits. With the new TracBack feature riders really can let their minds be free and ride wherever the road takes them, as it is now as easy as a button push to navigate along that same route back to where the adventure started. No more guessing which lane motorcyclists need to be in to make an upcoming turn. Lane assist with junction view guides riders to the correct lane for an approaching turn or exit, making unfamiliar intersections and exits easy to navigate and gives a peace of mind. It realistically displays road signs and junctions on the route along with arrows that indicate the proper lane for navigation. The new zūmo 350LM is expected to be available in the 3rd quarter of 2012 and will have a suggested retail price of $699.99. The zūmo 350LM will be available in North American and European versions. The zūmo 350LM is the latest solution from Garmin’s consumer automotive segment, the leading worldwide provider of portable navigation devices for automobiles and motorcycles. From turn-by-turn navigation and fast and accurate search capability to traffic avoidance and lane guidance, Garmin’s user-friendly PND solutions have innovative features that provide time- and fuel-saving benefits to meet the demands of everyday driving. For more information about Garmin’s other Motorcycle products and services, go to http://www.garmin.com/us/products/ontheroad/, www.garmin.blogs.com and http://twitter.com/garmin.